A tuto about preparation of imported drawings. You have been a substantial contributor here, and I would like to contribute, as well. I don't see many problems, but there are a few of vernacular and sentence construction, which is natural to see between languages. Your mastery of English is exemplary. I'm unfamiliar with how we can make contact, but chary of displaying my email address here in public. Perhaps Andy has an "exchange" facility? I attach the Word file (zip), and you can make the same after correction to reply, file is very small. I shall attend to this presently. Here is a slightly fixed-up version. I changed the vernacular a bit for native English speakers, moved one section from the end to the middle to "warn of problems before discussing solutions", and altered very little else. My version might contain a typo or two (I hope not, but you know how reality is), but you did a marvelous job, and are to be commended. I wish Americans spoke and wrote English as well as you. Thanks for the chance to help. Please ensure that none of my changes altered your meanings. I take no offense at that. I would, for English, change the word "fastidious" on the last page to "tedious". In English, it better matches what I think was Dave's intent. I can suggest one minor addition. One can generally select almost all the lines in an imported DXF via Ctrl-A and or mouse area selection before doing the join. Selecting a small precision for the join will then generally ensure that you get the result you want. For drawings with many individual line segments needing to be joined, this method is much faster than individual clicks. 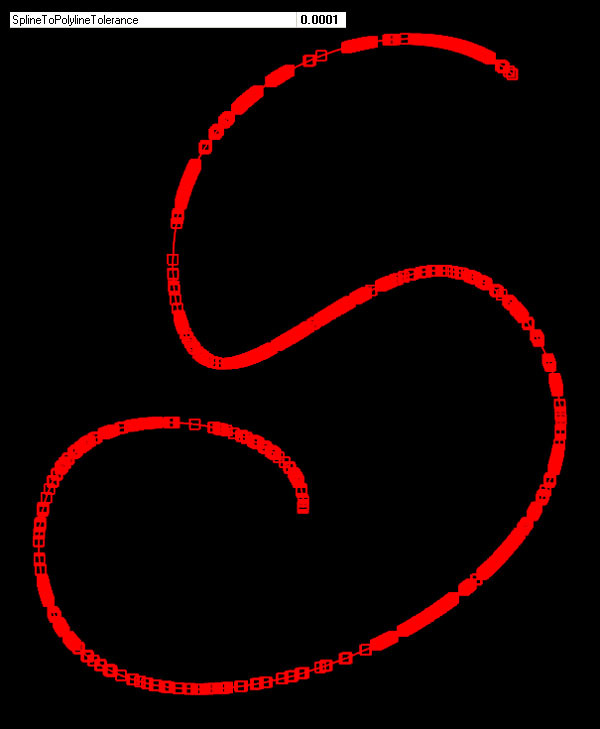 Sometimes when spline are used and/or with certain soft, the accuracy of the drawing is too hight, and you have thousand of knot to define an arc or spline after conversion in polylines. 1 the Gcode file is very long. I use a method and Ralf another to solve this problem. An important parameter is Tools/options/SplineToPolylineTolerance It control the accuracy of the resulting polyline. You must set the SplineToPolylineTolerance value before opening the dxf. 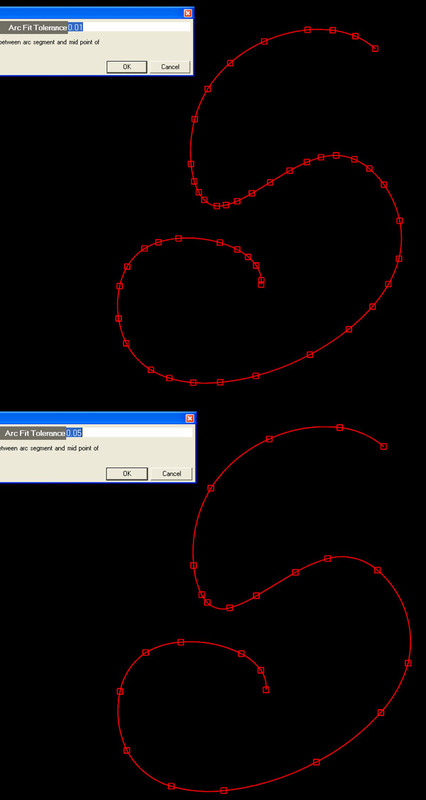 Ralf uses another method that allow control on each polyline, He uses the Edit/Polyline/Arc fit function. Here is the same dxf but imported with very high accuracy. I use "Arc fit" for the reduction of the nodes in Arcs. 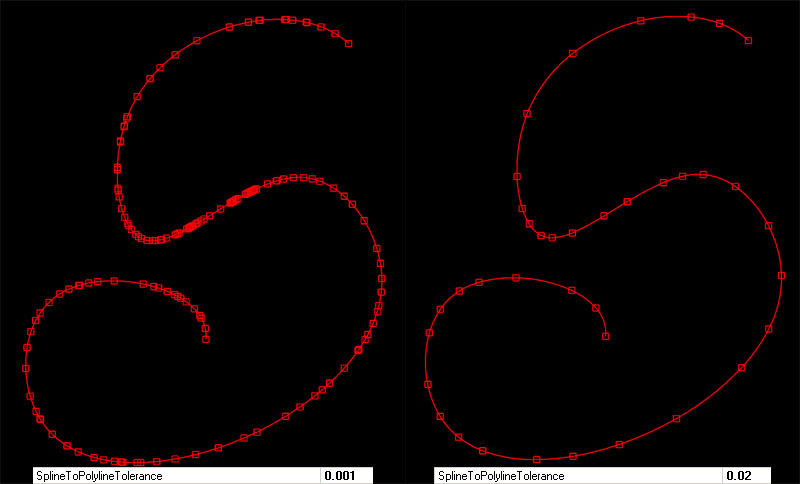 I think the difference is the SplineToPolylineTolerance affects the import of all splines, no matter if it curves or straight or angled lines. Arc fiT has only affect only to arcs. In addition, I can not control the outcome and the quality of the reduction of the nodes while importing and I can´t reverse the reducing process for looking of differences. These are my thoughts, so I prefer Arc Fit. We learn something new every day. I just tried what you suggested and it worked great. I had over 2900 nodes on my project and now I'm around 250 with looks to be pretty good results. I think that you just helped some one else . That would be me. Thanks.